Do not adjust the color! This penne pasta gets its deep orange-yellow color from fresh pumpkin purée and was the perfect base for a tasty alfredo-style pumpkin and chanterelle mushroom sauce. With a pumpkin arriving in our most recent box of produce from Full Circle Farms, I eagerly anticipated creating a dish of pumpkin and chanterelle lasagne. The idea was to layer slices of pumpkin and mushrooms between wheat lasagne noodles along with cheese and a cream-based sauce. When I pitched this menu to Jack, he wrinkled his nose and said something about taking the fall pumpkin spirit too far. So there I was with a beautifully ripe pumpkin, a couple of cups worth of aromatic chanterelles, and an unsatisfied craving for a pasta experiment. So I decided to make a twist on my original idea by creating a pumpkin pasta and a sauce to accompany which would bring together the flavor of pumpkin and chanterelles. To avoid being vetoed again, I offered to give Jack a night off from cooking and create the dish as head chef. This way he could relax and I could satisfy my craving. He remained skeptical, but was willing to go along. Win-win, right? 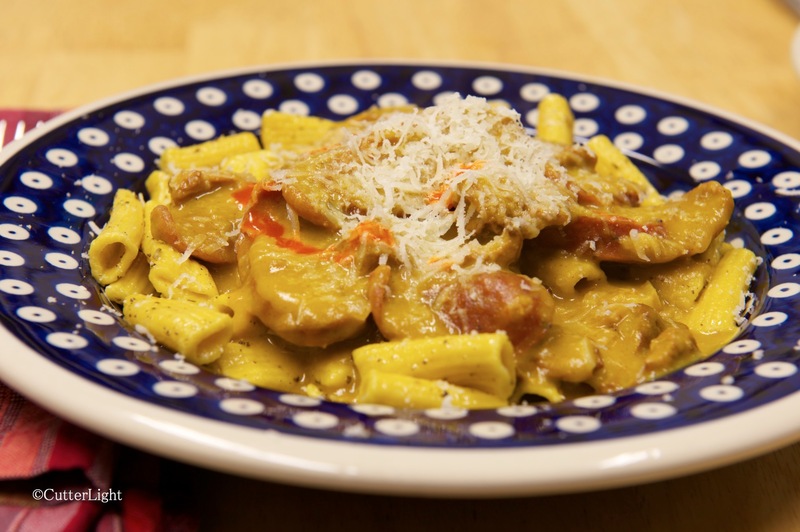 A savory, satisfying meal of pumpkin penne served with a creamy pumpkin chanterelle sauce and slices of chicken apple sausage warmed up a truly blustery Arctic night. No flights in or out of Point Hope the past couple of days, and hurricane force gusts punctuated gale and storm force winds. Freshly grated parmesan cheese and a dash or two of Cholula sauce finish the dish. Throughout the whole meal, Jack kept mmmm-ing in approval and muttering about how different the combinations of flavors were and how beautifully they worked together. Although I added mildly spicy chicken sausage, this recipe would work equally well sans meat. When thickening a sauce such as this, we have found that rice flour is superior to other thickening agents. Heat oil and sauté shallots, garlic and chanterelles for about 3 minutes. Stir in chicken stock, pumpkin purée, whipping cream, Cholula sauce, nutmeg, cinnamon, salt and pepper to taste. Let sauce simmer and thicken. If it needs to be thickened, add a rice flour 1 tbsp at a time till desired consistency is achieved. Stir sage into drained pasta and toss with some olive oil. Place pasta on individual plates, add sauce, and finish it with grated parmesan cheese and a splashes of Cholula sauce. Whisk together eggs and pumpkin. Place semolina flour in a large bowl. Make a well in the middle of the semolina flour. Pour egg mixture and olive oil in well. Use a fork and scramble eggs into flour. Keeps scrambling until dough resembles large curds. Add small amounts of water if needed. When all the dough looks like large curds, knead dough several times in order to form a dough ball. Cover dough tightly with plastic wrap and let rest for 20 minutes. 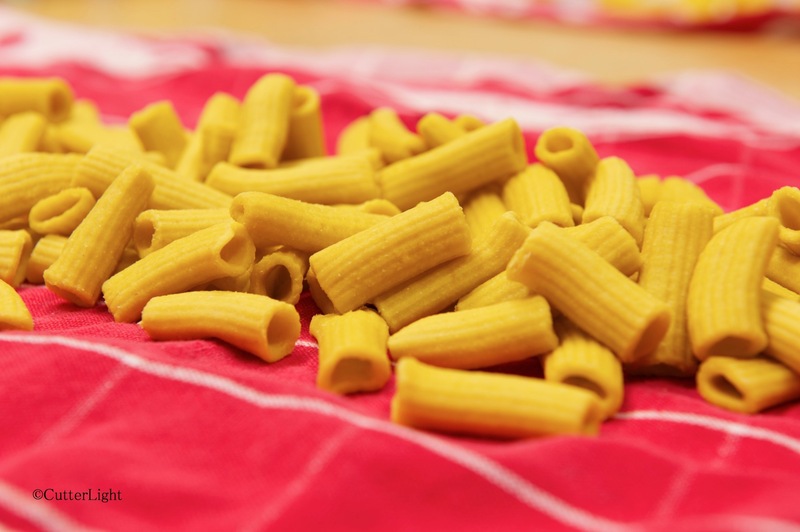 Follow pasta machine manufacturer’s directions to form noodle shape of choice. Thanks Sunshine! Send us some of that So-Cal sunshine! My mouth was watering even as I was reading – and it’s only 11am here in – West Wales. I planned on my own spaghetti -galese tonight; just hope I can last out the day. This turned out to be an instant favorite – something we will definitely make again. Happy dining! This looks gorgeous! Love the colour and can’t wait to try it! Thanks for the compliment, BHH. Enjoyed your post on the Tiny House Movement – a concept that very much interests us as well. Thank you 🙂 I’m looking to downsize to a Yurt (hippy cliche I know…) sometime soon and so hopefully will have some first hand experiences to post soon! Yum! We took our pumpkin from Full Circle and made a classic pumpkin pie and crust from scratch topped with our signature bourbon whipped cream. Oh my Jack H. Donachy, it was good! Love bourbon whipped cream. (And miss it!). We’ll be making pumpkin and pecan pies later this fall/winter. BTW, Bar’s baking Great Courses baking class has a really good crust making method. We’ll pass it along in a future post. Seriously, why are y’all teaching in the bush? You need to open up a restaurant in LA or NYC and become billionaires! Thanks for the kind words, Meredith!